For attractive and well-made workstations for your office in or around Cape Coral, Florida, turn to the seasoned professionals at ROF. 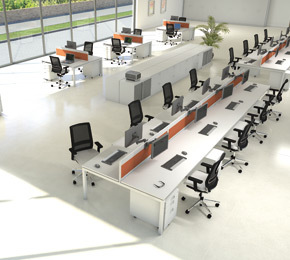 We have been in the office furniture industry since 1991, and since then, we have become the top choice for businesses all over the country for top-quality, affordable new, used, and refurbished/remanufactured workstations. At ROF, we have a talented and highly experienced staff who will work with your business in the Cape Coral, Florida, area to find you workstation systems that perfectly suit your office at a price you can afford. And, since we have a 140,000-square-foot warehouse that is continually filled with a rotating inventory, you can rest assured you’ll have plenty of workstations to choose from. We’ll also take care of the installation, so your business can be up and running with newly-purchased cubicles in no time. If you would like to inquire about the workstations we currently have in stock, contact ROF today. We would be happy to answer any of your questions and proudly serve businesses in Cape Coral, FL, and elsewhere in the region.